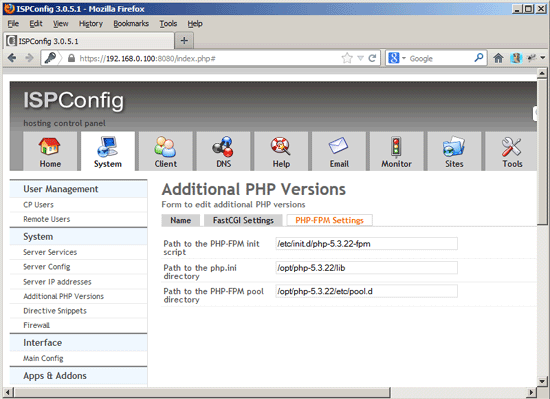 Since ISPConfig 3.0.5, it is possible to use multiple PHP versions on one server and select the optimal PHP version for a website. This feature works with PHP-FPM (starting with PHP 5.3) and FastCGI (all PHP 5.x versions). This tutorial shows how to build PHP 5.3 and PHP 5.4 as a PHP-FPM and a FastCGI version on a CentOS 6.3 server. These PHP versions can be used together with the default PHP (installed through yum) in ISPConfig. I will install PHP 5.3.22 and PHP 5.4.12, the latest PHP 5.3 and 5.4 versions at the time of this writing. I will also show how to build some additional PHP extensions such as APC, memcache, memcached, and ioncube. PHP-FPM and FastCGI are mutually exclusive in PHP 5.3 and 5.4, that's why I show two ways of building PHP, one for PHP-FPM, one for FastCGI, however you can compile PHP twice to get both, one time with --enable-fpm and one time with --enable-cgi (make sure to use different base directories, such as /opt/php-5.3.22 for PHP-FPM and /opt/phpfcgi-5.3.22 for FastCGI). The last switch (--enable-fpm) makes sure this PHP version will work with PHP-FPM. If you want to use this PHP-FPM version with Apache, please use --with-fpm-user=apache and --with-fpm-group=apache; if you want to use this PHP-FPM version with nginx, please use --with-fpm-user=nginx and --with-fpm-group=nginx. Open /opt/php-5.3.22/etc/php-fpm.conf and adjust the following settings - in the listen line you must use an unused port (e.g. 8999; port 9000 might be in use by the default CentOS PHP-FPM already), and you must add the line include=/opt/php-5.3.22/etc/pool.d/*.conf at the end. If you want to use this PHP-FPM version with Apache, please use user = apache and group = apache; if you want to use this PHP-FPM version with nginx, please use user = nginx and group = nginx. Starting php-fpm [05-Mar-2013 17:34:54] WARNING: Nothing matches the include pattern '/opt/php-5.3.22/etc/pool.d/*.conf' from /opt/php-5.3.22/etc/php-fpm.conf at line 511.
then make & make install. what i'm doing wrong. Sorry i'm new to this. This was perfect for helping me install PHP 5.3 alongside PHP 5.5 (Remi) for testing on Nginx PHP-FPM. I knew there was a way to run multiple PHP versions on CentOS 6.5, but I wasn't sure what the build commands where. I ended up using PHP 5.3.29. I also used /opt/php-5.3.29/var/run/php5-fpm.sock UNIX socket instead of the port listening. Thanks!!! Obviously, you did not tested this tutorial on Centos 6. There is no libc-client.a on Centos 6.6, so php won't build with the presented configure options. if you want this tutorial to give the expected results, you should also include the solution to build a prober imap library. The Startscript doesnt work with Centos 7.0. In CentOS/RHEL 7, the init scripts have been replaced with service units. Does any body know how to install an second php version or how to configure the start scripts? Thank you for a nice tutorial. I starting from with a topic "5 Building PHP 5.4.12(FastCGI)" but I use php 5.4.42 instead. I struck on a step #pecl -C ./pear.conf install memcached. I have got an error "configure: error: no, libmemcached sasl support is not enabled.". please give me an advice. Lets update this build for PHP 7 and CENTOS 7 please.